Sometimes the best gifts are those that make more than one person (or animal for that matter) happy. Plus everyone could always use another pouch, tote or T-shirt. Here, a few ideas. Tory Burch Seed Box, $98. Tory’s Seed box contains 7 products from women entrepreneurs along with a Tory Sport socks and a cosmetic case. 100% of proceeds benefit the Tory Burch Foundation which empowers women entrepreneurs around the world with micro loans and more. Article 22 Lariat, $145. Over 250 million bombs were dropped in Laos during the Vietnam War, 80 million failed to detonate. So founder Elizabeth Suda works with Laotian craftsman who use shrapnel metal to create jewelry. Part of all sales proceeds also helps to clear undetonated bombs. 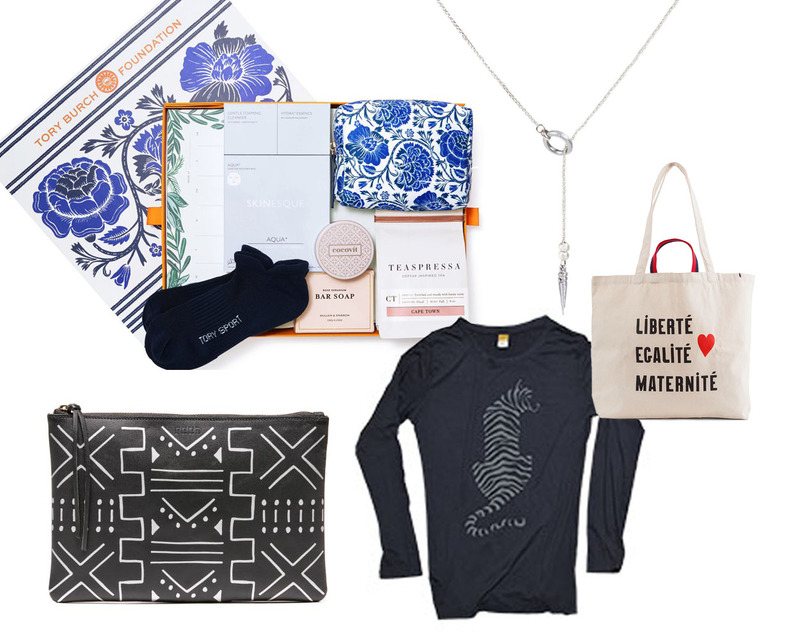 Clare V + Every Mother Counts tote, $65. Founded by model Christy Turlington, Every Mother Counts, works to help make pregnancy and childbirth safer for women across the globe. 100% of net proceeds to go EMC. World Wildlife Fund Tiger T-shirt, $55. Help WWF’s worldwide conservation efforts, because wild animals don’t just belong on T-shirts, I would prefer to see them safe and abundant in their natural habitats. Feed Leather Clutch, $85. This chic zipper pouch provides 50 school meals to needy children. Enough said.